The ongoing LA Auto Show is becoming a hydrogen-fest – after the Toyota Mirai, Honda FCV and Audi A7 Sportback h-tron, here debuts the bizarrely-named Volkswagen Golf SportWagen HyMotion. 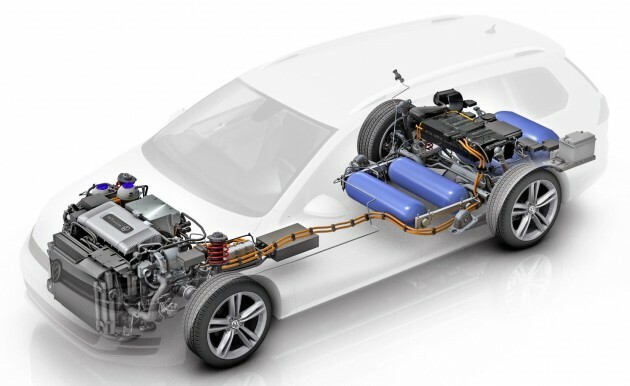 With this research vehicle’s reveal, the Golf is now the world’s first car to be powered by all drive types that can be implemented today, VW says. It does 0-100 km/h in 10 seconds thanks to a 134 hp electric motor (adapted from the e-Golf) that’s powered by a hydrogen fuel cell. The hydrogen is safely stored in four high-tech carbon-fibre tanks which are located in the underbody in a “space-saving way.” Filling up the Golf SportWagen HyMotion takes just three minutes, for a total range of almost 500 km. The concept also packs a high-voltage lithium-ion battery that stores kinetic energy recovered from regenerative braking, helps in the fuel cell’s starting phase and boosts acceleration. It isn’t clear at present whether the Volkswagen Golf SportWagen HyMotion will become a production reality. The Wolfsburg-based carmaker says a proper infrastructure must first be created, as well as ensuring hydrogen production uses renewable energy sources. And of course, there’s always cost.